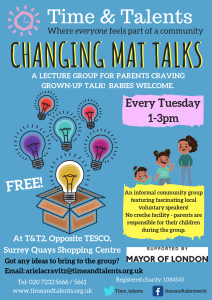 A lecture group for parents craving grown-up talk! Babies welcome! This group is now run by our new Family Community Development Worker, Ariela. She’ll be taking your ideas for talks on an ongoing basis, as well as creating a schedule of interesting speakers on topics from the arts to wellbeing.